Day 2: High School Spanish Pays Off! 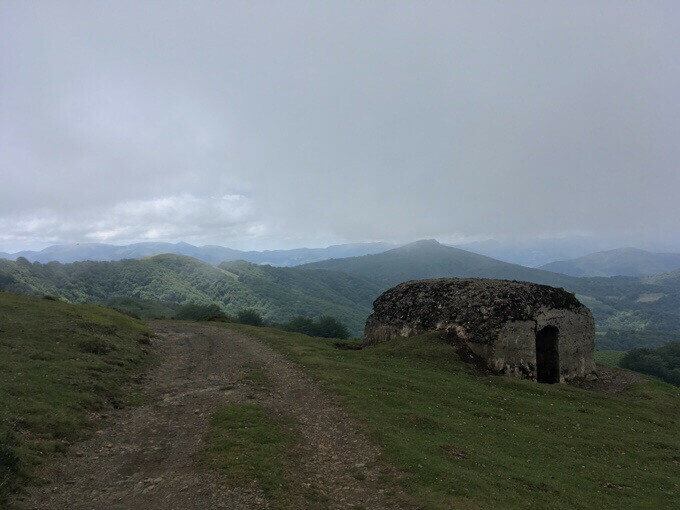 After going to bed with clear skies last night, a heavy fog (not uncommon in the Pyrenees) moved in overnight with light rain. Being under trees, very little was hitting the tent, so Why Not and I didn’t even close our storm doors on our tents. We woke up at 6am to surprisingly little condensation, but the mesh doors on both our tents were soaked from the fog blowing in it seems. Welcome to the Pyrenees where weather can be all seasons at anytime. Jim rallied us to get up and hiking by 7:05am. As we packed up, we could tell the fog was lifting. 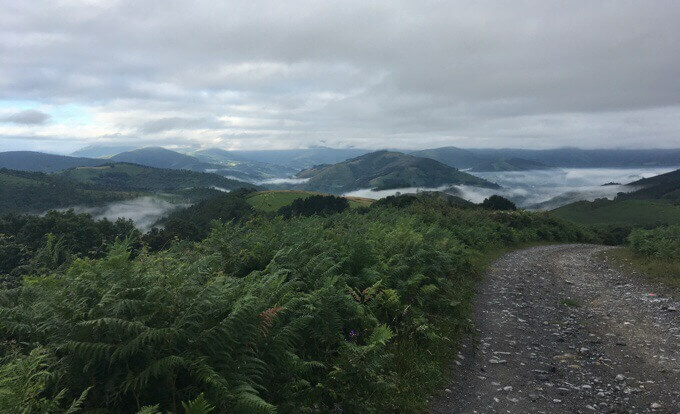 We joined the GR11 for a handful of hours, and climbed up steadily to see settled fog in the valley breaking up. The GR11 (in Spain) is also a red and while blaze like the GR10 (in France). Even though we were on the well signed GR11, we still wanted to practice navigating with the wordy guidebook we have. There were many instances today where we weren’t easily able to match the directions to what we were seeing. There are so many similar turns that we found it easy to make the descriptions match even if we weren’t there yet or had passed it. 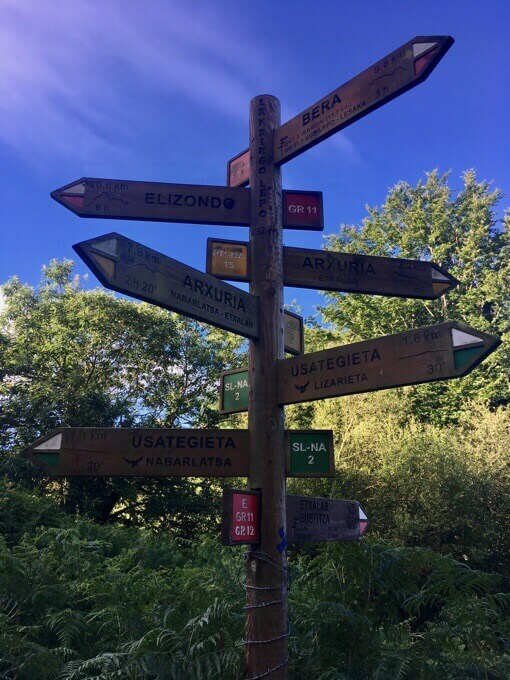 We have an old gpx track from previous hikers, so we always knew we’d figure it out, but things have since changed possibly, so we try to be alert to directions. it was good practice to try without using the gpx, but we did end up double checking it quite a bit. I’d say most of today was uneventful with hardly any others along our path. We leapfrogged a bit with one man that seemed to be on the GR11, but wasn’t interested in talking, and met a couple and a man each section hiking the HRP the opposite way as us. I do want to mention the sheep that wear bells on their necks that are everywhere, and also the dogs that are rarely leashed and bark and charge like crazy, but have yet to jump on any of us. Here’s a fun video of these wonderful sounds. Note that these videos on WordPress seem to like to load fully before playing rather than streaming more immediately. After lunch, we had a climb and then a descent that followed a ridge into the small village of Arizkun, where Why Not and Jim hoped to get food. The ride down to Arizkun on the right. 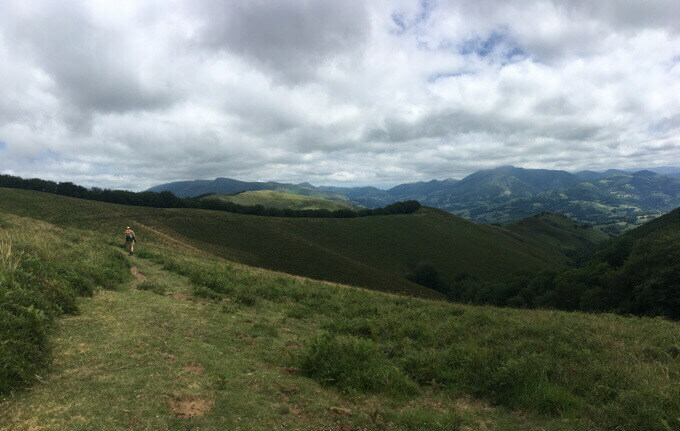 A draw of European hiking is how accessible amenities and food can be from the trail. Many hikers choose to carry minimal amounts food and then eat at restaurants and/or creatively buy from tiny shops. The freedom, convenience, and impulsivity is attractive, but it can also be risky, expensive, and time consuming. Why Not reminded me today of her saying that at her age of badassery, she believes that, “Paying for expensive light gear is cheaper than paying for new body parts.” She’s now added to her theory that, “Eating at restaurants along the HRP is also cheaper than new body parts” haha! I have a well weighted pack with a few more days of food remaining from what I bought in Paris, which is my strategy so I won’t need to worry about making it to town during store hours. The catch is that particularly in these small villages in Spain, stores will open midday and open again in the evening. There are no formal hours and it’s basically a roll of the dice that it will be open at all. Generally, we were told stores are closed on Sundays. Today, was Monday, so we figured we may have to wait for them to be able to buy anything, but it should be open. As we walked into Arizkun at 3:45pm, it was a ghost town/village. No one was around. I will detail this experience as it’s very common of what to expect in these small villages. We found what looked like the bar and restaurant and knocked on the door of the home. A small girl around four years old peered through oblique glass and no one would answer. 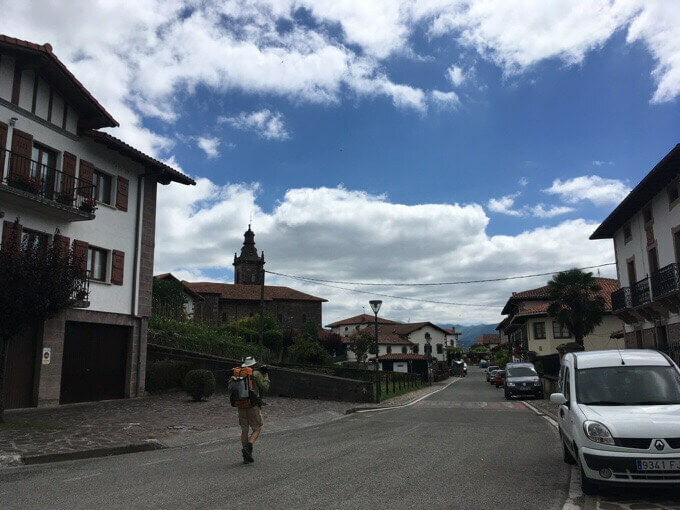 We had a fun broken conversation with the only others we saw, a nice French couple that spoke a bit of English and were staying a night in the village while walking a Camino route. They said it was open at 2pm, and were back for a meal surprised it was closed as well. We didn’t want to be rude and sat down to wait assuming it would open soon. After 30mins or so, children suddenly emerged from homes and were walking by. A woman came by with a baby and I was able to talk to her in Spanish enough to find out that she didn’t know why the restaurant wasn’t open, but that a store around the corner would open at 5pm. Then a group of kids came and one knew some English. He was excited (as was I) to be communicating in his non-native language and excitedly brought me to the store before realizing it was closed. Then I returned to another woman out and about that I was able to speak Spanish to that explained that it’s Monday and nothing is open on Mondays, argh. Then an older woman opened the window above the restaurant and conversed with the woman to confirm they were not able to help. We were just about to leave and make due with what we had when a woman came out and spoke to me in Spanish. She repeated what we knew about Mondays and I told her we just needed groceries. Then she said, THAT she had some of. Oh man, finally! Why Not and Jim happily picked out meat, cheese, bread, and even a tomato. I got bread for bonus food. Whew, mission accomplished! It is a great feeling to be able to mostly communicate out here and even help out Why Not and Jim since they don’t know Spanish. It’s classic small village Spain like you’d imagine being in a movie and it was surreal to be a participant. I’ve fallen out of practice, but picked up a lot about 15yrs ago when I worked with Hispanic kids in inner city Chicago whose parents didn’t speak English. We walked out of town around 5:15pm, with the bells tolling on the church and got water at a wall fountain with chickens running around. 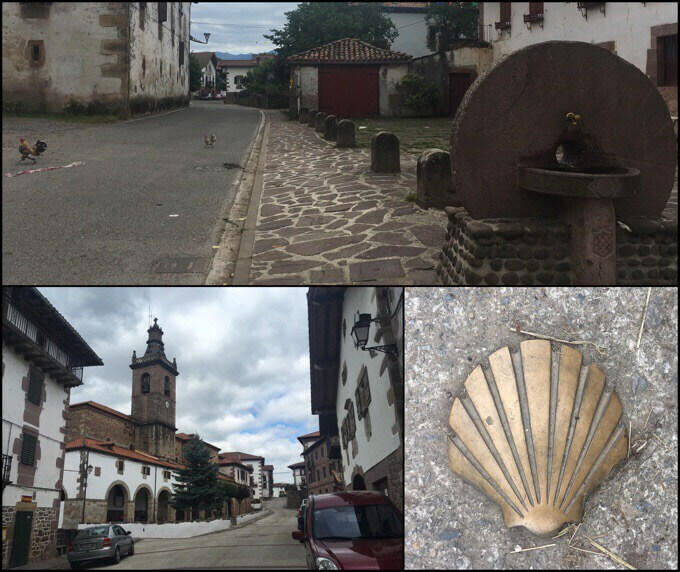 I also saw my first Camino symbol of the sea shell. Classic scene! 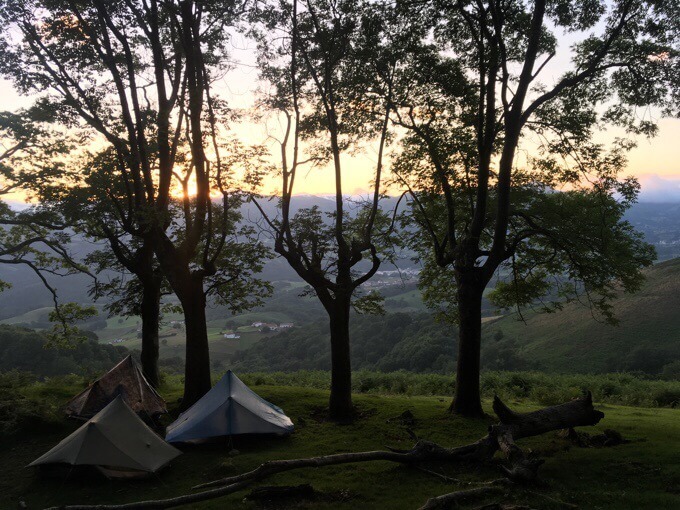 We knew from beta of previous hikers where there might be camping. After a break partway up, we ended up choosing a pretty great spot a bit off the route. It’s protected under trees next to an old rundown shelter of some sort and overlooks the whole valley. We had a tight fit for three tents, but made it work. What a beautiful end to a day. Weather was humid today and will get hot tomorrow, but it’s perfect and cool tonight with clear skies. A light breeze has kicked in and the lights are shimmering down in the valley. Yep, I’m a happy camper. As a note about general things, it’s been great to get our bearings together and spend time with Why Not and Jim before I split off probably soon. We’ve had fun and anytime Why Not and I can get together, we value a great deal. There have been some hiccups in the background to let you know there are many things to juggle and organize for a hike. I’ve realized on my Gaia navigation app that I mistakenly loaded the France maps in detail, but not the Spain ones. It’s workable until I try to zoom in. Also, my waypoints disappeared randomly today and that was a pain, but magically reappeared later. In an attempt to get the waypoints, I powered my phone off and back on. As soon as I did that, I got a notice that my SIM card was locked and requires a password I threw in the trash at Angelynn’s in Paris! I messaged her using my inReach device and she amazingly found the trash in the bin outside and went though it an found the tiny card with the PIN on it, whew! That was really random that it asked to reenter that, but a warning to others it may happen out here for some reason. Ok, it’s well after midnight, this happy camper better get some sleep. Loving this new adventure … it’s so different from the Australian and New Zealand one you did -and it seems like just last week that you completed those . Great to know you are on your way. I use the viewranger app, check it out, their maps are superb, and it is all free ! 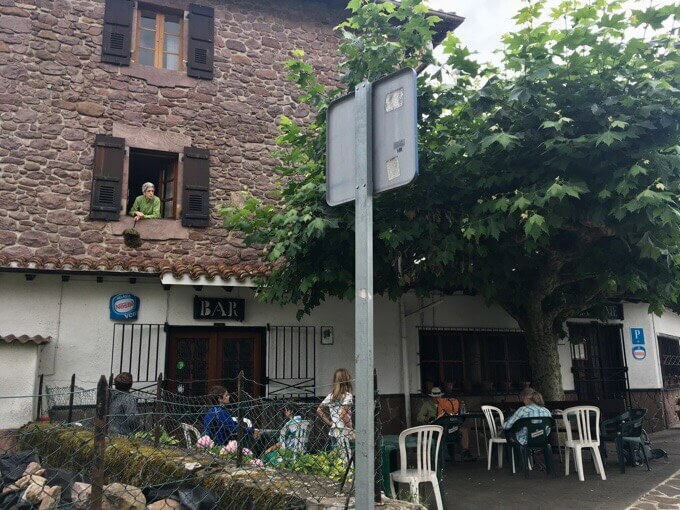 Even on the crazy busy Camino Frances the village stores are generally only open between 11.00 -14.00 then 17.00 – 19.00/20.00. Can be annoying when you arrrive somewhere mid-afternoon and want to eat! If you like bunkers, come to Switzerland, there are thousands of them here. The architecture of the town may even be protected by law. 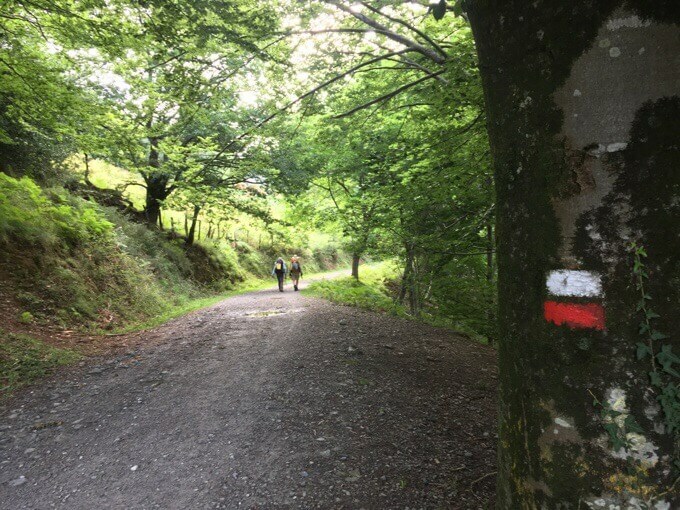 In a wise move, France and Spain protected long stretches of the camino as like national heritage. It is great to be back on the trail with you. And what a unique tour this will be. Nice that you and Why Not get to start out together. I loved the vid with the sounds of the sheep bells and the dogs. Well done. I remember this part of the GR11 like it was yesterday. 🙂 That is a bunker from World War II. Ahh, not having that pin must have made you twitchy. Certainly would have been my reaction! Good to see you posting. You may split off from Nancy, but many of us are following both of you, so we get double the pleasure! Haha com dios (y con in reach). ? 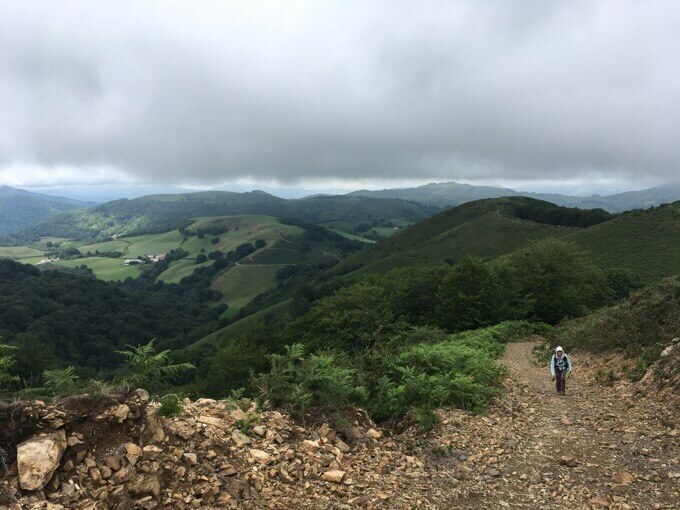 Wired, Just finished the Camino de Santiago (French way) from St Jean Pied de Port. I’d be interested where you cross that path. If you cross it in the morning, you should run into an international cast of walkers. Have fun, sounds like a great trip.